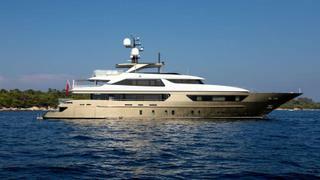 The 46 metre motor yacht Trident has been listed for sale by Bart Kimman and Jean Marie Recamier at Camper & Nicholsons International. With exterior styling and interior design by Francesco Paszkowski, Trident was built in steel and aluminium by Italian yard Sanlorenzo and delivered in 2014. Accommodation is for 10 guests in five cabins comprising a full beam master suite on the main deck, VIP suite, double and two twins. All guest cabins have entertainment centres, television screens and en suite bathroom facilities while the crew quarters sleep nine staff aboard this yacht for sale. The saloon has comfortable seating on L-shaped settees, a bar and an entertainment centre including a large Loewe television screen and a Kaleidescape server providing on-demand video and audio. More relaxation is available in the skylounge, which has been fitted with L-shaped seating, an entertainment centre and a stereo surround sound system. Relaxed dining is available at a circular glass-topped table. Her top speed is 16 knots and she boasts a maximum cruising range of 4,500 nautical miles at 10.5 knots with power coming from two 2,011hp Caterpillar 3512-C-DITA diesel engines.